Here are some little things people do in Korea when they drink soju. 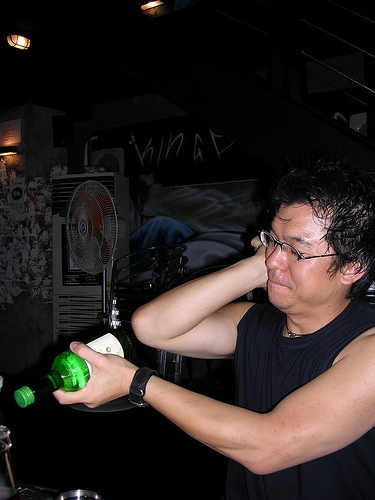 Before opening a chilled bottle of soju, hold it upside down and tap the bottom vigorously against your elbow. Don’t know why. Maybe to disturb sediments. Maybe to make it open easier. It’s inevitable. Whenever one opens a bottle of soju, there is always a metal strip dangling off the cap. People at the table pass it around and try to flick off the strip. The person sitting to the left of the successful flicker has to drink a shot. After flicking the strip, the flicker looks at the bottom of the cap, where there is a number. Everyone takes turns guessing it. The flicker tells them if the number is higher or lower. You have to guess within the parameters. For example, if someone says, “Thirty,” and the flicker says, “Higher,” you can’t guess below thirty. The person who guesses the correct number has to drink. I always lose these games.